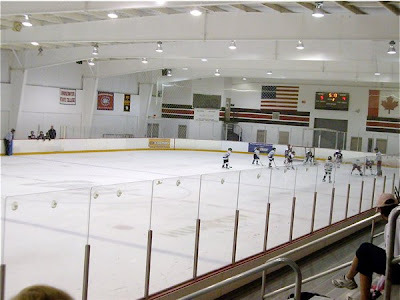 September 25th 2009, I, my cousin, and her kids went to Bridgewater MA for a game of hockey and American footie! That meant sports and grub, hockey mum style, ringside. 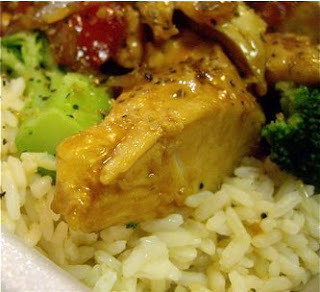 - chicken and American chop suey made by a Russian cook. Only in America! This was food served in styrofoam containers and eaten with plastic cutlery. Still it was surprisingly good. I am annoyed by the fact that I have forgotten the exact name of my dish, but it was much food, and even more rice, and I agreed with my cousin that it was wickedly good. My chicken was very tender chicken and vegetables were well prepared, with a bite to it. My cousin Erica chose American chop suey. I do remember, as I expected it to be a Chinese or Chinese inspired dish. Oops! I had forgotten "American." I love wikipedia, as it had a very enlightening section on American chop suey. I found that the only Chinese with this dish is the name. American chop suey may also be called American goulash (not remotely Hungarian) or more correctly Macaroni and Beef. At least that explains what is in the dish. 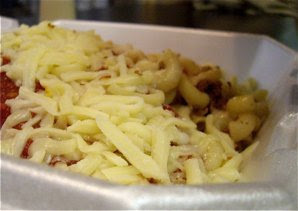 Beef, macaroni, tomato sauce and as here; cheese, makes it into more of an Italian-American dish. I had a bite, tasty very decent sized serving. Erica told me that the food had improved greatly after they had a new Russian cook. Italian style food, with a Chinese or Hungarian, name cooked by a Russian in Massachusetts. True fusion! Only in America!